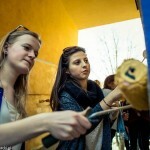 On Friady , March 28, citizens of Warsaw, Cracow, Lodz, Poznan and Koszalin joined the initiative of Project: Poland Association and with brushes in their hands marched on the city walls!! This was the first spring edition of HejtStop project, run within the Citizens for Democracy programme. In every city there are places, walls disfigured by inscriptions that plague the minds of their inhabitants. 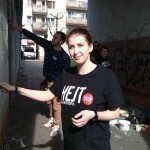 HejtStop project involves volunteers, citizens in cleaning the common space from the signs of hatred and bringing it back to the local community.